The Princessa de Penasco is a beachfront resort with many wonderful amenities. The resort was designed to emulate the shape of an arc. The arc is made up of five yellow towers that have a beautiful Old World Mexican courtyard in the center. The courtyard has several red brick walkways with flower lined grassy areas shaded by palm trees. The resort has premium amenities like 3 swimming pools, a Jacuzzi spa, and palm frond umbrellas above lounge chairs in the sand. The resort also includes a sand volleyball court where you can challenge your neighbors to a game and an ocean view fitness center that has everything you need to stay in shape. The resort also includes an on-site cantina called Colin´s. Colin´s has wonderful daily food and drink specials. This is a very safe resort with 24-hour on-site security. C 404 is a 1 bedroom and 1 bathroom condo is located on the 4th floor of the C Tower. This condo has an ocean view and accommodations for 4 guests. The living room is very lovely with rust colored walls and a brown suede sofa and matching brown sued armchair. The room has an oak wood coffee table chest, matching lighted end tables and a media stand. The media stand has a TV, DVD, VCR and stereo. In addition the condo comes with high-speed wireless Internet so you never have to miss an email and you can upload your vacation pictures to Face Book for your friends and family to see. You can reach the terrace through a set of sliding glass doors off the living area. In the dining area there is a round alder wood dining table with four brown cushioned chairs. There is a beautiful light fixture hung from the ceiling to light the dining area. The walls of the condo are adorned with some beautiful woof framed pieces of art. In the kitchen there are dark granite counter tops with black appliances and fully stocked shelves and drawers. The kitchen has all the items needed for you to feel as if you are cooking in your own home kitchen. There is a counter bar off the kitchen with three bar stools if you prefer more casual dining. The master bedroom has painted blue walls with a king size bed that has teal, neon green, yellow and pink floral bedding. There is a dark cherry wood nightstand on each side of the bed with a reading lamp and a dresser across the way with a TV. You can hang your clothing in the large double door closet with full-length mirrors next to the large bay view window. The bathroom can be accessed through the hallway or the bedroom. The bathroom has a single mirrored sink vanity with a walk in shower made of travertine and a commode. The terrace overlooks one of the pools and is furnished with a table and chairs. The patio would be the perfect spot to kick back and relax with a cold beer or frozen margarita while you feel the warm ocean air kiss your skin. You should definitely dine outside in the evenings so that you can witness the world's most beautiful sunsets. 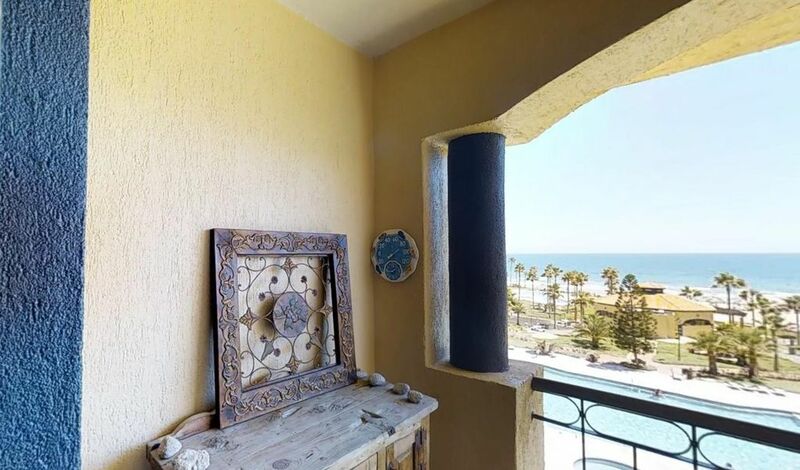 You will be elated with the amenities and experience you have in this condo inside the Princessa de Penasco! Book your trip to paradise now! It was ok for the price, not sure I will book that condo again . Great view of the ocean, close to amenities. Sofa sleeper will only fit 2 kids age 9 or below. Bed was too soft for our taste. The condo itself needed some TLC. Very nice clean condo. Perfect for a couple of days. My husband and I will definitely love to stay again!